Hello fellow Nail polish lovers! We all love our nail polish babies, take care of them, use them graciously and do our best to keep them stored for maximum life capacity. But what happens when the Nail polish gets gunky and too thick? Or when your favorite indie glitter polishes need 2-5 minutes of vigorous movement in order to remix glitters into pigment? Or how about those wonderful AIR bubbles that make a fresh manicure look like cheap china made flip flops? WHAT DO YOU DO? WHAT CAN YOU DO? There are some solutions to fix and maintain PROPER life and formulation of you nail polish. There are also some HUGE DONTS that you ought to be aware of. 1. DON'T EVER shake the nail polish Up and down. This creates air bubbles and makes your manicure look like those cheap china made flip flops at the dollar store...eek!! All the work of properly doing your nails so they can look like cheap china made products is, TOTALLY NOT WORTH shaking your nail polish up and down. 2. Do NOT, i repeat, DO NOT use acetone to THIN down your nail polish.So what if your grandma did it or your mom and it seemed to make the polish come back to life. Truth is, we as woman spend a good bit of hard earned MONEY, especially if you buy indie polishes or HIGH END brands, to be killing our nail polish with acetone. 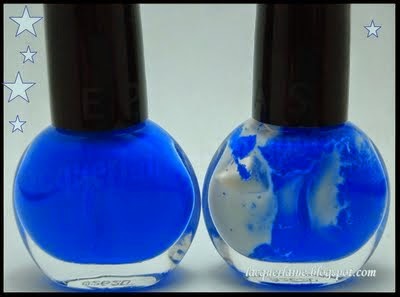 Nail polish thinner is formulated first and foremost, to IMPROVE VISCOSITY of the nail polish and help it flow better. Thinner helps repair your gloppy, gunky, thick nail polish back to its original store bought smooth consistency. Both nail polish thinner and nail polish remover contain similar ingredients BUT thinner does NOT contain acetone or water, 2 ingredients found in most nail polish removers on the market. ACETONE is created to break down the nail polish on the nail bed and remove it. Get it, remove. Acetone removes nail polish so why would you pour it in your cherished bottle of ____________ (fill in blank for one your favorite polishes) and not think there will be severe consequences? - over the long run, will create a nail polish that is super gunky and has to be tossed, leaving you back at Square one. SO PLEASE TELL ME WHY, would you try the acetone method if its only going to result in having to toss your beloved nail polish away in the, not too distant, future? So please, for my sanity and all of us who want our polishes to last indefinitely, DO NOT USE ACETONE/ nail polish remover AS A replacement for nail polish thinner. Would you add add vegetable oil into your car, hoping it would provide the same results as motor oil? So DON'T do this to your lovely nail polishes, PLEASE. Buy nail polish thinner. It's so worth it and lasts a long time. oK OFF that soap box now :) thanks for hanging in there. Now tell me after all the hard work, wait time, and clean up, would you let your manicure turn out like this? and last, but not yucky least, epic bubbles....kinda looks like fish eggs or something.... yuckers! Stay tuned for nail polish DO's. You don't want to miss this one, I PROMISE YOU THAT. "Have a grand day and dont forget to Glaze!"